1. Cook the quinoa by dry roasting in a heavy bottomed saucepan . Then add the hot stock and cook for 20 mins, stirring occasionally - add a little more hot water if it starts to stick. 2. While the quinoa is cooking, whisk together the lemon juice and zest, olive oil, orange juice, cumin, salt and sugar in a small bowl to make the dressing. 3. 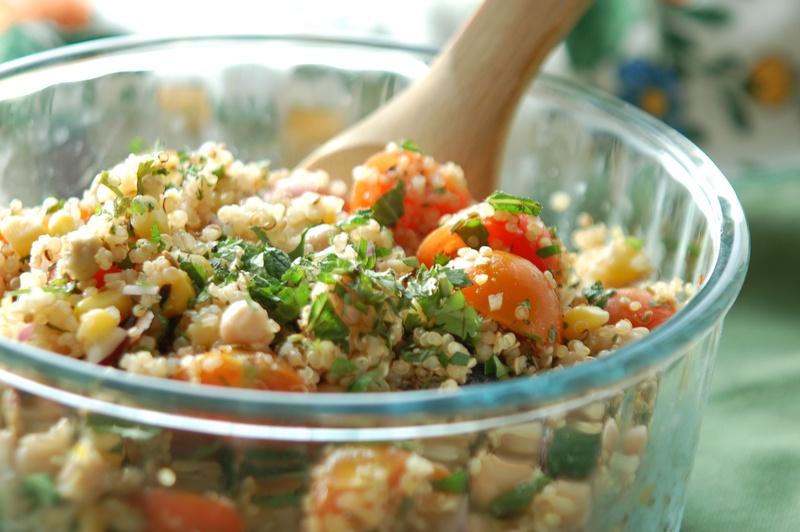 Combine the quinoa and all remaining ingredients, except fresh herbs, into a medium-sized bowl. 6. Warm pitta bread through about 10 minutes before serving. Serve salad with the pitta, a dollop of yoghurt on the top - and a little harissa relish if you like things a little spicy!